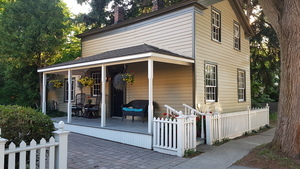 The Alexander McKee House has been lovingly restored and furnished to offer guests a relaxing stay in historic Niagara-On-The-Lake. We are located on the most gracious street in the heart of Old Towne. Sit and relax on the porch and watch the horse drawn carriages go by. The Alexander McKee House is within walking distance to the lake, golf course, fine dining and the towns shopping area. The cottage rental accommodates 4 people.